WordPress is a well-known platform for Blogging and it is being used by millions of webmasters and bloggers. It is a self-hosted blogging platform. MBT is hosted on Blogger.com but, there are hundreds of other popular blogs which are hosted on WordPress. So therefore, WordPress can’t be ignored for Blogging. It is also called WP in short words by webmasters. It is a CMS (content management System) which provides you the opportunity to set up your blog easily. And it is totally developed in PHP, a popular web programming language. 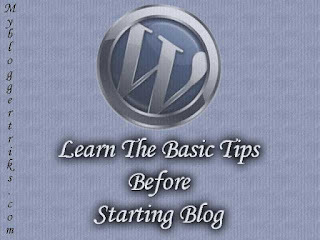 In this post I will give you some basic tips before establishing a blog with WP. My tips will be for securing WP, optimizing WP and designing WP. But before going straight to my tips I would like to give you some information about WordPress features and benefits. What are the Advantages of WP? If you choose WordPress for your Blog you will benefit from the many features WP provides. There are tons of free and premium plug-ins, Themes you can use to design and optimize your blog. WP blogs have professional themes and frameworks. The installation of WordPress is also easy and can be done in minutes. There are many companies and individuals who make WP themes and plug-ins for WordPress users. Also, WordPress is SEO friendly by default. There aren't many disadvantages, but in my opinion; WordPress is a web development environment with complex coding of PHP. And that’s a big problem for newbies, because new bloggers can’t customize WP themes or templates easily. While blogger is a platform where even an absolute beginner can easily manage/design their blog. But without having sufficient knowledge of PHP you can’t do anything complex. The security for WP blogs is also an issue for newbies, because WP blogs are hacked most often if they are not well secured. These are some issues which can be handled by learning the basics of WordPress and here now I am going to share my tips with you. The very first thing to do for WordPress security is to change the default Admin details. You can change your default user name & password by going to users page on your WP dashboard. You must change the default user name and password in order to secure your blog from being hacked. While installing WP script from your cPanel you’re given a default user name and password. So your first step is to change it with a strong one. You can select a strong password by using a combination of different characters like this one: [myname123is!^*(#] and it is necessary for security reasons. Also, change the default user name to a better one. If you go to your WP dashboard and click the general option under the setting tab; you will find a check box saying “Any one can register” which is already checked by default. At the beginning of your blog you need to uncheck it. Because someone can register to your blog and can harm you. Later on, you can once again check it and assign a role to the new members. Never assign the Administrator role to new members. Always assign a subscriber or contributor role to new members. This way, you will only be the Administrator of your blog. In your WP Dashboard there is a link called “Privacy” under the setting tab, click that and check if the radio button is selected or not which says “Allow Search engines to index this site” if not then instantly select that and save the setting. This way, Search engines will follow your blog and will index it. This is very easy step, when you get your blog’s dashboard. Visit General Option under the setting tab and make the necessary setting. In site title insert your Blog title which shouldn’t be more than 3 or 4 words. In Tagline, just insert a little bit description about your site. WordPress Address URL and Site Address URL are same, leave them as default. Put your email in Email box and make the date and time setting according to your country/region. Next go to the reading setting. If you want to show your latest posts on home page then do nothing. But if you want to show static page on your blog’s main page then select the radio button “A static page”. Also you can select the number of posts you want to show on your blog’s home page; there will be 10 posts by default and you can select minimum or maximum posts to show on main page. In order to set up your blog successfully on WordPress you must consider installing some free plug-ins that are exist in WordPress library itself. I will give you a list of plug-ins which are about securing your blog, optimizing your blog and socializing your blog. In order to install a plugin; just click on the plugin link located at left side of your WP dashboard and search the plugin you want to install. Akismet is a plug-in that protects your blog from spam comments and track back spam. It is 99% effective. It detects the bad comments and saves your time. AntiVirus plugin is a smart security solution for your blog which saves your blog from different malicious attacks and spam injections. AskApache is an advance security plugin which blocks the attacks on your password & Installation. This plugin blocks an IP address from a given range and blocks the hacking attempts on your WP admin. Hackers mostly attack by knowing your WP version, if you hide WP version then your blog will be more secure. Replace WP-version hide your WP-Version from all. It checks all the basic security measurements of your blog. Sometimes your WP blog get hacked when hacker gets your password, so this plugin encrypts your password when you login to your WP admin. This is also a very good plugin which informs you by email that what happened to your blog. If someone deletes something or adds something to your, it will instantly inform you. Even if your blog got hacked it will inform you about the activity. This is the most used plugin on WordPress. By installing this plugin you can write Meta title tags, meta description tags and meta keywords separately for Search engines. It is very useful plugin for SEO. This is another important plugin. This plugin generates your sitemap for Google. You will just have to add this sitemap once to your Google webmaster account. It will refresh your sitemap whenever new content will be added to your blog. And will inform Google crawler. This is another great plugin for WordPress SEO, it is also all in one and can perform better than All in One SEO pack it used perfectly. This plugin is very simple and lovable. It shows the most relevant content below every post when they are viewed by visitors. This is an awesome plugin which shows the social sharing buttons below every post of your blog. In some templates, it can also be added to home page. This plugin sends your recently added post to your Facebook fan page or profile wall. I like this plugin and recommended to use. This plugin shows your most popular blog posts image thumbnails; same like Blogger blogs popular posts. It will add attractiveness to your WP blog. These were just some basic tips from my own experience. You may be having different experience with WordPress. Please share your thoughts in comment section.